If you couldn’t fit it into your schedule before, you get another chance! Kathleen Bogart will be teaching Psychology of Disability once again this fall. One out of five people have or will develop a disability in their lifetime, but we rarely think about society’s underlying assumptions regarding this common human experience. This course will explore disability from social psychological and disability studies perspectives. We will explore the social construction of disability and its inter- and intra-personal ramifications. This course departs from traditional psychology courses that focus on impairments within the individual and attempt to normalize people with disabilities. Instead, this class will explore how society’s conception of disability is the main source of handicap. Posted in Disability History, Disability Research. The other day I went to a game night among friends. 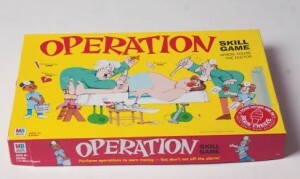 Among the games available was a recent edition of “Operation”. For those unfamiliar with the game, the basic premise of the game is that players have to remove small objects with tweezers from wells without touching the sides. Each object is supposed to represent an ailment. For example: ‘Water on the knee’ is represented by a bucket, a pulled muscle is represented by a rubber band and so on. While we set up the game I was surprised to find a small bird that was to be placed in the well associated with the head. The ailment was called “Bird Brained”. Bird Brained: ditsy, insane, nonsensical, light headed, etc. At first I was taken aback and then found myself very offended. The idea that the mental disorders associated with insanity could be operated on surgically goes back to a very dark time in U.S. history in terms of health practices. In 1935 it was common practice to drill hole into the heads of patients experiencing psychotic or depressive symptoms. Many thought this would help release demons. Antonio Egas Moniz, who came up with the procedure was given a Noble Prize for his work in 1949. Success of a procedure was measured by how much the patient “calmed down”. Walter Freeman is the one who made similar procedures famous in the U.S. in fact, he was the one that modified the procedure and coined the term ‘lobotomy’. However, his version involved separating the entire pre-frontal cortex from the rest of the brain by inserting a surgical device behind the eye after the patient had been knocked unconscious by electroshock. (However, being the talented showman that he was he would often insert devices into both eye sockets simultaneously) He performed lobotomies on as many as 2,500 people. This came at a time when the nation was desperate to find solutions to mental illness. So, when Freeman’s patients seemed to no longer be exhibiting symptoms (in addition to not exhibiting a great many other things, like personality) many other doctors took up the procedure. Between the “insane” asylums, shock therapy and anti-psychotic medications available at the time and now lobotomy, there were very few safe treatment options for those suffering from these illnesses. At this point the conversation is over. Chemical lobotomy. With that harsh point made, I would like to make it clear that I have had some very good doctors. Excellent doctors who cared for my recovery in a wholesome way and I owe them a large debt in terms of that end. However, I have many friends that have not had good doctors, doctors that diagnose without enough information and prescribe with even less. The problem seems to me to reside in a huge power differential. The doctor has years of schooling and is probably constantly able-minded. The patient on the other hand is probably very scared, conditionally able minded and typically has no or little background in the field of mental health. Society tells us that people with mental disorders are not able to manage themselves and do not know what is best, therefore it is the job of the Able Minded to come in a rescue us from our plight. This philosophy is very disempowering for those that would seek wellness. On top of that I can speak from experience in saying that it is very hard to advocate for yourself while wrestling with these disorders. When I first went in to seek medical attention I was very vulnerable to my care providers and I am grateful that they sought out my best interest through medication and non-medication methods. I know of those that have given up on doctors due to negative experiences and are now self-medicating, or not medicating at all with varying levels of success. I think that doctors have to potential to be powerful allies for those of us who struggle with illnesses such as these. However, I feel the strong need to suggest a revision of prerogative on behalf of these care providers. For them to examine whether they are here to “save us” of if they are here to supply us with the tools to secure our own release. Disclaimer: The views expressed by guest bloggers do not necessarily represent the views of Disability Access Services or those of Oregon State University. Posted in Awareness, Disability History.